MIDI stands for Musical Instrument Digital Interface. It is a protocol that allows MIDI-capable devices to communicate. 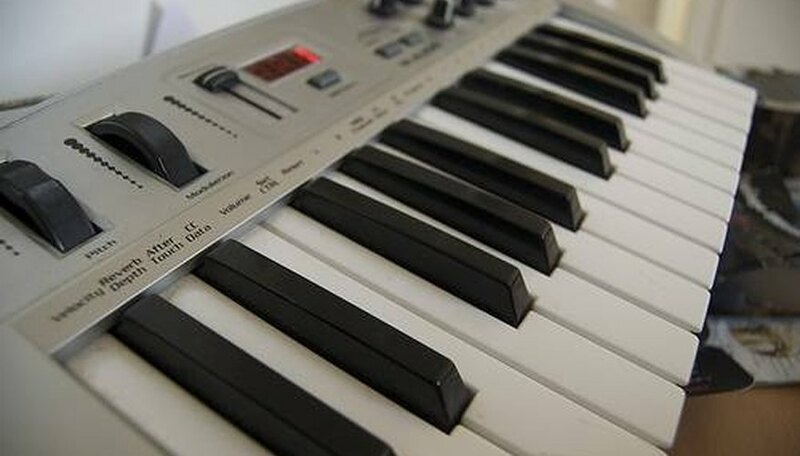 All you need is a device that can send MIDI, such as a keyboard, and a device that can accept a MIDI signal as a command to play a sound. The generic term for a device that can do this is a "sound module." These can come in many forms, from simple drum synthesizers to orchestral synthesizers. Every device is different---read the manual to determine exactly how to adjust the midi settings. Connect the port on the keyboard labeled "MIDI OUT" to the port on the sound module labeled "MIDI IN," using midi cables. Set the mode of the keyboard to "MIDI" (on some models, this is done by simply turning off the "Local" feature). Use the manual to determine how this is done on your particular unit. Typically, this feature is clearly labeled on either the keyboard controls or, if it is has a screen display, on the main menu. Set the MIDI keyboard to be the "Master" (sometimes called "Controller"). Use the keyboard manual to determine how this is done. This allows your keyboard to control other devices. Set the sound module to be the "Slave." Use the sound module manual to determine how this is done. This allows the sound module to be controlled by the keyboard. Connect speakers or headphones to the sound module so that you can hear the output. Play the MIDI keyboard. You now should be able to hear the sound module's output. A "MIDI THRU" port allows you to connect a second sound module. This is called a "daisy chain."